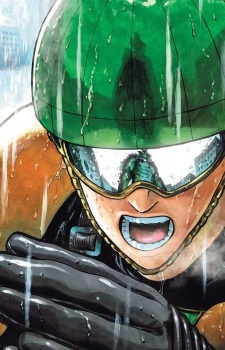 Mumen Rider is a C-Class Superhero from Z-City. He has the #1 rank of the C-Class. The Mumen Rider is a young man of average height and weight. He wears an armored suit, with light colored armor covering his torso and shoulders. He has a black leather suit under the armor and black gauntlets and kneepads. He also has a green bicycle helmet and dark shades. He is a courageous young man who rides his bicycle everywhere. He is shown to be a man of justice and he never gives up. He uses his bicycle as a weapon by crashing it into his enemies and fights using hand to hand combat. He is shown to have relatively average strength and average speed but great resiliency. He is good friends with Saitama. Many individuals hear the word "superhero" and think of Superman, Captain America, or any of the other traditional comic characters. However, One Punch Man demonstrates that being called a hero and actually being one are two very different things.